WOW, you did it again. We had a net gain of 26 NEW Grangers for the quarter ending June 30th. Your efforts are really paying off. Your Granges are really being seen in your communities. Congratulations. You do realize that growth comes with a price, right? That price is going to be new ideas, new energy, and new ways of doing things. Are you ready??? You better be. The Granges that are experiencing true growth are embracing these “new” ways. Our new Grangers are forcing us to be vibrant and relevant. They are expecting us to be the organization we were founded to be, an organization that paves the path to a better tomorrow for its members and community. These new Grangers are all very interested in the state of their community and many are actively involved in their communities at all levels, and are active in multiple organizations. If we do not embrace their ideas, mentor them in the standard procedures used in the Grange and why they are used it will be a challenge to keep them enthusiastic and involved. Your deputy force is here to assist in any areas needing attention. They are well versed in all aspects of Grange procedures and are always happy to help. I realize there needs to be a paradigm shift in many of our Granges to bridge the gap between the enthusiasm of our new Grangers and the somewhat complacency of some of our existing members. 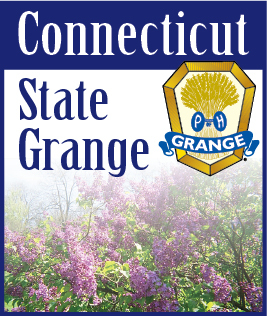 Please, I beg you to embrace this new energy, encourage these new ideas, and together enjoy the fact that your efforts have enable the Connecticut State Grange to have a net gain of 26 in the quarter ending June 30th, 2012.